Last year we did a post about complete dry/dehydrated meals stored, ready to use in jars. These complete freezer meals are a similar concept, but with more of a focus on saving money and creating convenience and saving time down the line, by taking an afternoon out and to create the meals in one go, to store in the freezer until they are needed. When a meal is needed, just defrost and cook! Natalie says it is possible to make 46 meals, in four hours, for just $95. This is not a substitute for emergency food storage, as if the SHTF, the power will likely go off and then your freezer isn’t going to work… That said, this is a good idea for people who work long hours, or those with kids. Make ahead when you have the time and then you have your own healthy freezer meal when you need it. How Should Senior Citizens Prepare For SHTF? Sure, some people in their 60s can do this, but most can’t. To be honest, many 35 year olds can’t either! Anyway if you’ve moved into the senior citizen category, and you are fed up with all the young, fit and able prepping advice, you’ll be happy to hear that ‘Graywolf Survival’ have written a post just for you! Check it out below. Here’s the thing – I have asked the question several times on the K.W.N Facebook page, is prepping a whole family activity, or are you prepping alone, but for the whole family? From the replies I received it would appear that there are an awful lot of individuals who take care of all the family’s emergency preparedness activities by themselves. This is fine, but what happens if something happens to person in charge of the family’s preparedness? Below is an excellent post about the importance of writing a letter, or some instructions, containing all the important information regarding all the preps, routes, plans, money, weapons and tactics etc. Obviously it would be better if the family as a whole were involved and up-to-date with the emergency preparedness tactics and plans but if that is not the case, leaving some clear instructions for your family to follow, in your absence, is the next best thing. Check out the post and find out more below. Give the gift of preparedness! Ok, when I say free, I am assuming you already have something laying around which I always seem to have – a broken printer… If you don’t have one, chances are you know someone who does! If you can get hold of an old printer, some CDs and a length of pipe or a broom handle, you have everything you need to build a small scale hydroelectric generator. Now this hydropower generator isn’t going to generate much electricity, probably just enough to run an LED light from, but that’s not the point. This is an awesome little project to do one afternoon, for two reasons – it is a great project to do with the kids to demonstrate recycling and reusing old things, AND it is an excellent introduction to building a hydroelectric generator, showing you the basics of hydroelectricity, should you want to scale things up and build a generator which is capable of generating a usable amount of electricity. If nothing else, it would make your kids’ day, if together you built a hydroelectric generator from an old broken printer, and make that LED light glow! The Trucker’s Friend is an all purpose tool, designed for truck drivers. Basically it does hacking, prying, wrecking, pulling and pounding! It weighs around 2.5 pounds and it is just under 20 inches in length. I think it should also be called the Prepper’s Friend! Two HUGE additional bonuses are – it is made in the USA and it is backed by a ‘no hassle’ Lifetime Replacement Guarantee, very cool! The Prepper’s Friend, sorry, Trucker’s Friend, currently sells at $59.95, which I think is an awesome price given its versatility, quality and the no hassle replacement guarantee. I have had my Trucker’s Friend for around a month or so now, and overall my thoughts are very positive. It is a truly versatile wrecking machine. It does everything stated, BUT, and maybe this is an obvious point, it doesn’t do these things as well as the individual specialized tools would. For example, the hammer does its job, but it is not weighted or balanced in the same way a specific hammer is, so you have to use more force to hammer nails etc. Don’t get me wrong – as a prepper/survival tool it is highly recommended. If you want one tool with multiple uses, this is the tool for you. However, for around the home, day to day use, I would reach for a specific hammer or axe first. A few other things to note – the Trucker’s Friend is a very nice length/weight, at 20 inches with 2.5 pounds of weight, it has a nice heft and swing, specifically for chopping/wrecking. The biggest negative is the sheath, which is terrible. It is made from very cheap thin plastic, and mine was ripped when it arrived. Personally I think this tool should come with a small kydex sheath which covered the axe blade and fastens around the head. This is not a deal breaker it is very easy to make a DIY kydex sheath (search YouTube for tutorials), and this is exactly what I will be doing! The Trucker’s Friend is a solid and dependable, multi-use tool which can also double up as a weapon in an emergency self-defense situation. 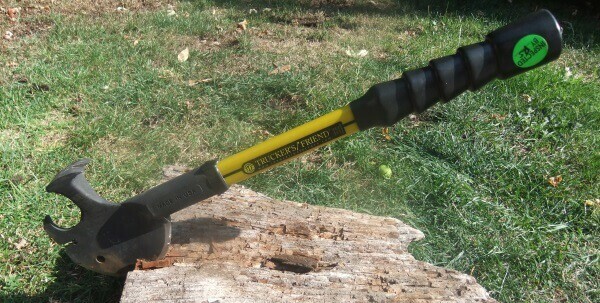 Its versatility makes it an obvious choice for preppers etc, who are looking for an all-in-one hammer, axe and pry-bar. It costs $59.59, which isn’t small change, but I think it represents excellent value for money, especially when you factor it that it is made in the USA and it comes with a lifetime no quibble replacement guarantee. Break it, they’ll send you a new one! My recommendation – buy a Trucker’s Friend and spend 30 minutes to make a simple kydex sheath.